When food is thrown out, the energy used to grow, harvest, process, and transport it is also wasted. 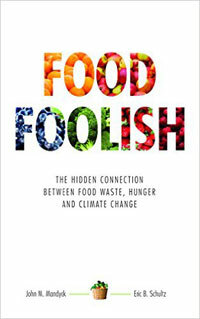 That’s John Mandyck, who with Eric Schultz authored the book Food Foolish: The Hidden Connection Between Waste, Hunger, and Climate Change. In the book, the authors argue that in order to make a dent in the 3.3 billion metric tons of CO2 produced by food waste worldwide, we have to reduce that waste at every level. And in the United States, the scale is pretty staggering. But in spite of this, Mandyck is hopeful U.S. food waste and the resulting emissions can be cut in half within 15 years. He says educating consumers about the harmful effects of food waste and promoting better shopping habits will be key strategies. Reporting credit: ChavoBart Digital Media/Peter Bresnan.